At the Night Before E3 Event, EA SPORTS gave members of the Community and Game Changers a first look at the entire EA SPORTS 2012 lineup. Check out our man Wepeeler and other FIFA Community guys enjoying some FIFA 13 here. You’ve just got to love KSIOlajidebt! 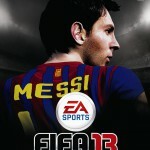 Check out his hilarious but actually very observant breakdown of the E3 FIFA 13 Gameplay Trailer. Thoughts? Check out all of KSIOlajidebt’s videos over at his YouTube Channel (you won’t be disappointed!). We have 16 brand new screenshots for you which were released following last night’s EA Press Conference at E3. The images cover EA SPORTS Football Club, EA SPORTS Football Club App and EA SPORTS Football Club Mobile iOS. Check out all the images below.